I knew this sandwich was going to be good, but I just didn't know how good. Wow! This sandwich exceeded my expectations by far. In just one bite you get all of the flavors out of that classic Buffalo Wing appetizer; chicken, blue cheese, sauce, and even celery, but with out all, well--some of the mess. The fact that the chicken isn't fried and that there is very little butter in the sauce makes my arteries a little happier. O.K., who I am kidding. I'll just make up for the loss of calories and fat in a little dessert afterwards. If I owned a sports bar and grill, I would put these on the menu STAT. 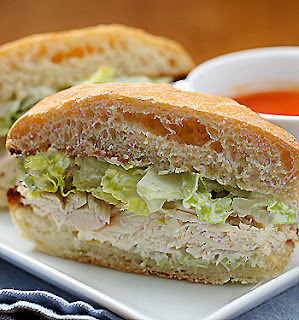 But, if you are like me and you enjoy being in the comfort of your own home during sporting events, especially when the Chicago Bears and the Green Bay Packers go head to head for a Super Bowl bid this Sunday, then I really think this would be the perfect sandwich to serve for your party. I roasted my own chicken, but a store bought rotisserie chicken will save you time. I made my own Ciabatta rolls, but a good sturdy french roll will do. Just don't use a soft roll because it will get soggy in the sauce. I also recommend using a good quality wedge blue cheese. The pre-crumbled cheese lacks in flavor. Assemble the sandwiches, slice them in half and plate them with a small dish of the dipping sauce and let your family and friends dip in and cheer on the home team--Go Bears! Set the oven rack to the highest position and turn on the broiler. In a medium saucepan, bring the hot sauce, broth, and butter to a boil. Reduce the heat to low and keep warm. In a medium bowl, combine the mayonnaise, celery, blue cheese, and lemon juice. Place the rolls buttered side up on a baking sheet and place under the broiler until lightly browned and toasted. Remove the rolls from the oven and evenly spread the blue cheese mixture on each top and bottom halve. Place a handful of lettuce on the bottom halves and top with shredded chicken. Season with salt and pepper then place on the top portion of the roll. Slice in half and serve with the warm dipping sauce on the side. Enjoy! Thanks for sharing this recipe, Nicole. It was delicious! I made the blue cheese sauce before leaving for work and then picked up a rotisserie chicken on my way home. Made for a great quick weeknight dinner. I'm putting this on my menu for this week's meals... OMG I cannot WAIT to try it! Buffalo Wings and Blue Cheese... can't get enough! I found this recipe on Pinterest, and I LOVED it! Sharing the recipe on my blog this week so even more people can partake in the amazing-ness! !